Interplay wants gamers to join the Church of Harold before they take part in the upcoming Fallout Online. If you don't know who Harold is, you've missed out on one of the Fallout series' key characters. He's a ghoul/mutant that has appeared in each of the franchise's main entries, including the recent Fallout 3. 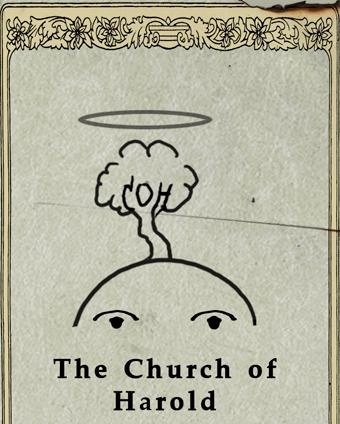 Harold is also now the part of Interplay's Fallout Online teaser campaign, which recently took the form of a "Church of Harold" pamphlet. A link to the pamphlet was emailed out by Interplay this weekend. It details the methods through which Harold must be honored. The Church of Harold is nothing if not honest. It says: "Unlike other religions, we promise nothing. But, unlike others, we back up our promises! We don't guarantee someone will be there for you... but they might." Harold was last seen **spoiler warning** being worshiped due to a tree engulfing him in Fallout 3, and he may be worshiped again in Fallout Online, though his form is not assured. At the least, Interplay seems to be planning to include him in the game, should it ever make it into stores. The tree once seen growing out of Harold's head definitely plays a big part in his religion though, with the pamphlet requiring participants not eat meat or plants, but they can eat fruits, milk, honey, sap, and insects. If I were stuck in the world of Fallout, it'd be an easy call to follow Harold above all else.